The Twist-N-Treat was recommended to me (http://www.premier.com/App_Content/media/busybuddy/BB_TNT2009.jpg, from one of the links shibamistress posted above), and I wanted to get it but the store I went to only had a large breed size. There was a similar toy that came in a smaller size, so we got that for our puppy (she's going on to 11 weeks). The concept is the same, but execution is slightly different (I'm attaching a picture). It seems to be called "Monster Mouth," made by Jolly Pets? I think. You have to cut up pieces of treats and put them inside, but if they're too big, I don't think it's much of a puzzle for the Shiba puppy to get at. But it does keep them intrigued, because they can smell and hear the treats, I think. For the bigger pieces, they're just not going to know how to squeeze the sides of the "mouth" to open it up so that the bigger treats fall out. I also use the Kong, but the regular toy, and freeze it with Gerber baby food inside when I know I'm going to need it to keep Mitsu occupied. I got the Twist-N-Treat for Conker in the first week I had him. It's one of his favorite toys and I use it for keeping him busy when I don't want to be barked at. He will try to use it as a fetch toy every once in a while or will throw it around. I also got him a Kong, but he didn't like that until he discovered that peanut butter is good. I have the same 2 puzzle toys, too. Stella loves them too! We also have the Kong ball that she just can't get enough of. A few regular kongs too and she uses them just the same when I put a handful of treats in them. And there are a handful of members that also have the Kong Wobbler. I bought it for Stella a few weeks after she came home, but she never really played with it much. I took it out again recently and she's been playing with it like a pro!! we have a nina ottosson toy- the dog brick. I think its one of jakes fav for sure. I was hoping to "re-start" this discussion since its been 3+ years and many "new" toys have come out. I was looking at the following does anyone have experience/cautionary tales with any of these? 1) Regular cone-kong: little guy loves it, but is learning the efficiency secrets (particulary if he throws it against the wall, the kibble will fly out everywhere). a "small" kong will occupy him for 15 or so minutes MAX. 2) Hol-ee roller ball: Haven't used it. 3) Busy-buddy collection: Haven't used them, but there are a lot of option. My living situation determines many of my choices. I try to avoid loud toys on the hardwood floor as a courtesy to my downstairs neighbor (who have a lab mix puppy a week older than Banjo. he LOVES that dog and when he barks, banjo, runs around in circles looking for him.). I have a rug on my living room floor over the hardwood floor. I like giving the kong in the crate, but he doesn't always oblige. My bedroom (where he sleeps) is carpeted. I would like to avoid giving him food in the bedroom because 1) He should know it's MY room, not his and 2) I don't wanna step on kibble at 5 am when he wakes me. What do you mean by "shiba approved"? Shibas are very smart and usually figure out the toy within a day (maybe an hour if they're motivated). Some owners like myself don't bother giving then puzzle toys because it bores them. I like more hands on training. Depends on what kind of toys you are looking for as your question is a bit vague. But since you have hardwood floors, i'd avoid anything that rolls. Maybe a kong wobbler? when I say "shiba approved", it has to be challenging. Our dogs are smart so something that can keep him engaged w/o boring him. The plan was to get 5-10 interactive/puzzle toys and constantly change them on him so he doesn't get complacent. I prefer real training too, but sometimes I need a few minutes to myself... i.e. to do dishes and would love for him to be "working" during that time. 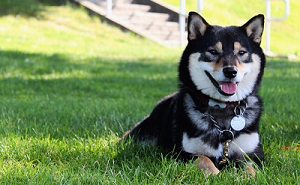 I am looking for any interactive toy that other shiba owners have found their dog likes. I'll check out the wobbler! I know some toys you need to twist, or pull the animals tail, etc. Just something not as simple to figure out as a kong. Can always give him a nice walk or a "tug o war" session to tire him out before you have to door his chores. Another way is to give him a chew treat like bullystick. When Bootz was a puppy, it took her 1-2 hours to go through a 6". So those are definitely worth buying. The following are some toys that I got for Bootz. She solved this within 5 mins. It was pretty sad lol. If she gets impatient, she'll actually flip over the whole thing. Haha darn clever Shibas! She solved this within a few minutes as well. This one I use to get her "working" for her kibble. It'll distract her a good 10-15 mins as well as teach her to eat slowly. But it can get loud on hardwood floors. The Omega Ball is not so tricky. We have it and Rigby loves it, but he finishes his kibble in it in 10 minutes or so. We use it to feed in the AM because he scarfs his kibble otherwise. The Busy Buddy Chuckle in Medium is great. It's too large/heavy for him to "cheat" and pick up to shake the treats out, so he has to roll it around or bump it over and over to get the kibble out. You can't put as much kibble or treats in at a time though, so if you're feeding a meal you'll have to replenish it more often. The Kong bone treat dispenser is good if you put break up little pieces of bones or treats, then cover the holes with PB. that one can take Rigby about 30-40 minutes to get it out if I use PB, otherwise its too easy. The Smarter Toys IQ ball was our favorite for kibble because you could make the opening smaller or larger depending on what you were feeding, and making it small made it harder to dispense and thus kept him busier longer. Unfortunately, he broke it open one time and chewed through the inner compartment rendering it useless, so if you try it, always supervise closely and know eventually it will probably be figured out. Awesome! Thanks guys! I'm gonna order like 15 toys later this week and see what works but I will most likely be ordering all of your suggestions for the "good ones"
Bootz, my little guy will NOT play tug no matter how hard I try. If a human tries to take something from him, he gives it up... most of the time. I also give him the bully stick, but I have NO IDEA how much to give him at a time so I usually let him chew for like 30 minutes and then take/replace with something else. When Panko was much younger a medium bully stick would last a week or more. Now that same bully stick will last about 30 minutes if I'm lucky. He certainly loves them though. I need to find something that will last longer now. We havent given him the Ottosson yet, but this site had a huuge sale so we picked up a few things. With the puzzle we gave him so far, it was a lot of fun teaching him to use it and he got it quick enough. And he definitely loves the Kong ones, those have been a lifesaver. Foot-long bully sticks and good old fashioned tug-of-war/fetch with me are Kira's favorite past times. Puzzle toys are too easy for her, once she figures it out she gets all the treats nearly immediately. We've been putting some of his meals in it so he's working his brain a little and not scarfing it all down in one gulp.... So far so good. I'm checking out feeding options. We have puzzle toys, but I want something I can feed full meals in semi-regularly to slow my speed-demon eaters down a little. I was also thinking about trying the Smarter Toys IQ Ball referenced above, but have read the warnings about them breaking it open... I also read a horror story about it getting stuck on a dogs jaw (it had to be surgically removed) so now I'm thinking no go on that one. I had the IQ ball. Bootz caught on really fast. She realized if she puts pressure on it with both paws she can crack it open instead of constantly pushing it. I correct her when she does it, and then she learned she can only get the kibble if she goes by the rules. There is also a plastic cube that dispenses like the IQ ball. Like any toy, monitor your dogs and know thy dog. I thought it was a great way to slow down her eating habits. Now I don't have to use it. Just feed her in a regular bowl. @BanjoTheBetaDog - yes I feed kibble. @Bootz - Good to know, and that food cube looks pretty interesting! I'm mainly thinking of using it for their evening meal, and maybe weekends, when we're around to supervise. The kong wobbler was a hit with banjo and meal time took like fifteen minutes. Thanks to all who posted these ideas, and to BanjoTheBetaDog for refreshing the thread. I've been looking for something for Miko too. She has found ways to play with her rubber Chuck it Ultra balls in a very feline way like rolling it with her nose under furniture and using her paws on other sides to get it out. Her hilarious trick of nosing it down the stairs to play fetch with herself is so funny. I wanted to find a game where she has to match the size of the ball in a hole of a top that would make it roll out the bottom. Silly? Maybe I'm thinking like toddler games of fit the shape. =)) . I'm going to try some of these and I'll let everyone know. I'm with @Kira_Kira, maybe I need to try this Kong Wobbler everyone's on board with. It seems similar to the Bob-a-Lot, I'm going to see if I can find side by side reviews of both. @Mori_Cris - We used to live in an apartment on the second floor with its own entrance so we had a set of stairs leading from a little entryway to the living room. Our Shiba also loved playing fetch with herself on the stairs! There is some new toy called an "iFetch," or something like that, and it shoots balls out for the dog to fetch. They bring it back and drop it in a hole on the top and it shoots out again. It's like your toy idea with an added fetch component haha! The Kong Wobbler is awesome. +1 to Kong Wobbler. All my dogs love that thing! It's really fun seeing them use it in different ways. Nala rolls it around with her nose flawlessly and is able to get her meal out in 5-10 minutes. Pacman uses his paws to bat it around which takes quite a while but he has a blast. Tali seems to like Pacman's method since she loves batting everything with her paws anyways. Thanks! Yes Ruffwear is very expensive here... I'll have a look to see if I "need" something from them.